Like Liberace, David Saffert is a classically-trained pianist from Wisconsin with a passion for both music and entertainment. 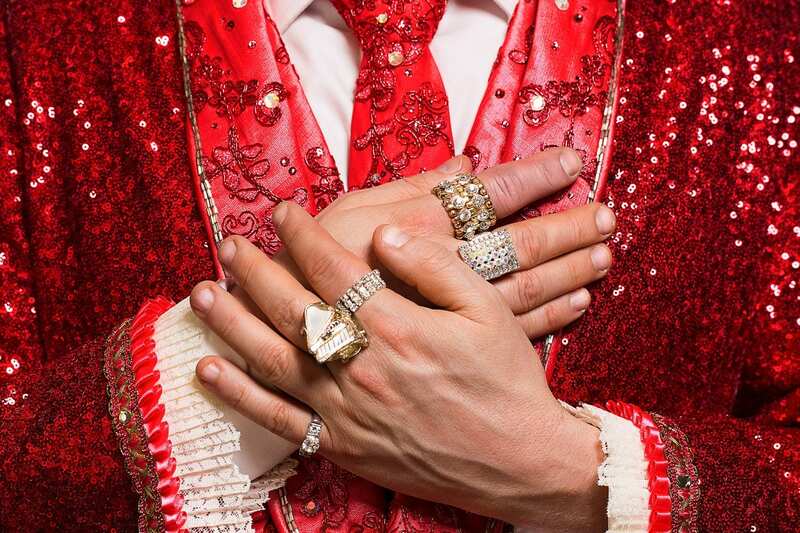 From elaborate costumes to painstakingly researched piano transcriptions, Saffert’s mission is to give audiences an authentic Liberace experience. After seeing Saffert’s portrayal, Liberace’s own music director, Bo Ayars, joined forces with Saffert to elevate the act to a whole new level, providing insight into the real Mr. Showmanship’s piano-playing, speech, and mannerisms. Most recently, David appeared as The Suspects in Murder For Two here at Broadway Rose, and was also recently featured guest on two Under the Vegas Sun television episodes which were filmed at the Liberace Mansion in Las Vegas. When not portraying Liberace, Saffert plays for the Portland Opera, Oregon Symphony, and Tony Starlight’s Showroom. Jillian Snow Harris has thrilled audiences across the country with her spot-on portrayal of Liza Minnelli. After graduating from college in New York City, the singer/actor/ comedienne started showcasing Liza in comedy clubs throughout New York before bringing her big voice home to Portland, OR, where she was featured in the US Premiere of Liza, Liza, Liza at Triangle Productions. Now a regular performer at Tony Starlight’s Showroom, Harris delights audiences with a diverse repertoire of famous female voices, including Bernadette Peters, Eartha Kitt, and Judy Garland. While her sharp comic timing and delightful Liza quirks will have audiences doubled over in laughter, it’s when she starts belting out songs that it quickly becomes clear that she is paying homage to one of the greatest living legends of our time. Bo Ayars is quite proud of his 13 years as Music Director for legendary showman, Liberace, contributing his conducting and arranging talents to Lee’s worldwide live performances, TV specials, and recordings. At various times, Bo has been Music Director, Conductor, Arranger, Pianist, and Music Producer for several super-stars, including Liberace, Elvis Presley, Barbra Streisand, Rachel Welch, and Jim Nabors. He’s conducted three editions of the Christmas Spectacular at Radio City Music Hall, and was Music Director for several national tours with the Walt Disney company. Bo presently lives and works with his wife/singer, Barbara Ayars, in Portland, Oregon.